There’s traditional makeup, and then there’s airbrush makeup. Wondering what the difference is between the two, or if there is a difference at all? Well, there is. Nearly everything in life comes with pros and cons—makeup types are no different. Let's explore the advantages and disadvantages of each. This makeup is very fine and light and is applied using an air gun machine. As the makeup comes out in mist form, the artist does a sweeping motion over the face, producing a thin, even layer. With the makeup being so airy, soft and distributed in specks, a matte finish is what results. And provided your makeup artist is highly skilled in this technique, you can be given the appearance of a flawless complexion. However, it should be noted that a flawless complexion is more likely to be achieved if your skin is in good condition, or at least pretty good condition. Those with lots of acne, acne scars, hypopigmentation, hyperpigmentation and other skin conditions may not benefit greatly from this makeup technique and would probably get better results and be more pleased with traditional makeup application since it provides greater coverage. That said, to achieve the perfect tone, the artist mixes a number of foundation colors until the right blend is achieved. What's more, the airbrush makeup can be easily applied to the neck and decollete area, making for a seamless, even tone. Advocates of airbrush makeup also feel they look more natural, especially since it allows your natural skin tone to shine through. Also, because it’s applied lightly, you don't have to worry about it looking cakey. Caked makeup can make imperfections stand out and enhance the signs of aging (e.g. fine lines and wrinkles). 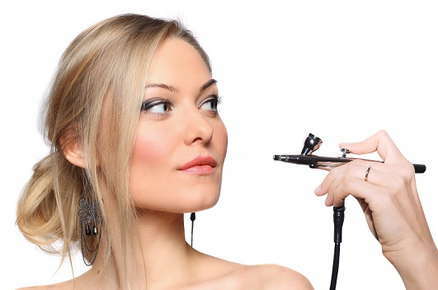 Unlike traditional makeup, airbrush makeup is longer lasting, in some cases lasting up to 16 hours. While some will contend that it is waterproof, it is actually considered to be more water resistant--this makes a difference. In the event you perspire, you will not want to rub or wipe your face as this can lead to the product being disturbed. Instead, it is recommended that you dab or blot the areas lightly. Another downside is that it cannot be reapplied after application; that is, unless you have your makeup artist on hand and have a location for their equipment. Traditional makeup is a little more varied, in that it comes in liquid, powder or cream form and is applied with one’s finger tips, a sponge, or a sundry of brushes that come in different shapes and sizes. Because traditional makeup has been around longer and comes in a variety of forms, there is a shade for nearly every skin tone out there. Coverage ability also makes it versatile. There are some with a sheer tint and others that can provide maximum coverage. Then, there are those that can be combined with other traditional makeup products to tackle specific skin problems. If you have the products in hand, or even if the makeup is set on your skin and you have makeup tools like a brush or sponge, you can either reapply the product or reset what’s already there. This makes traditional makeup more versatile and useful, because it can be used anytime and applied different ways. Unless the product says its waterproof, traditional makeup usually is not. And because it can more easily rub off, there is the risk every makeup wearer (or anyone that comes into contact with their face) dreads: getting makeup on your clothes. It also can become cakey, especially in cases where multiple layers and forms of makeup are applied--for instance, using a combination of liquid, powder or cream. This does not have to be the case, however. Again, finding a makeup artists with skill will ensure you have a light, matte finish and flawless looking appearance. Be it traditional or airbrush, the one you choose will largely depend on your preference and the makeup artist. The vast majority of makeup artists are more comfortable with traditional makeup. Not all makeup artists are skilled at applying airbrush makeup, but nearly all can tackle traditional makeup since it is the basic skill learned in cosmetology school and traditional makeup has been around and techniques have been perfected over a number of decades. But to better determine which style you like best, do a makeup trial with both and find which one suits you and your needs best.